(CNN) - Here is some background information on terror attacks involving vehicles used as deadly weapons by radicalized individuals or terror groups. Facts: Al Qaeda's Yemeni branch encouraged its Western recruits to use trucks as weapons. A 2010 webzine article, "The Ultimate Mowing Machine," called for deploying a pickup truck as a "mowing machine, not to mow grass but mow down the enemies of Allah." In September 2014, ISIS spokesman Abu Mohammad al-Adnani called for lone wolf attacks using improvised weaponry, "If you are not able to find an IED or a bullet, then single out the disbelieving American, Frenchman or any of their allies. Smash his head with a rock or slaughter him with a knife or run him over with your car or throw him down from a high place or choke him or poison him." Timeline: March 3, 2006 - Mohammed Taheri-azar, an Iranian-American, drives an SUV into an area crowded with students at the University of North Carolina at Chapel Hill. Nine people sustain minor injuries during the attack, which Teheri-azar later says is retribution for the killing of Muslims overseas. He is convicted of attempted murder in 2008 and is sentenced to 33 years in prison. October 22, 2014 - A 3-month-old girl and an Ecuadorian tourist are killed when a driver swerves into a crowd at a light rail station in Jerusalem. The driver, Abdel Rahman al-Shaludi, is shot and killed by police. Israeli media reported he published militant writing on Facebook and supported Hamas, a fundamentalist Islamic group that has conducted attacks in Gaza and the West Bank, but his family denied he supported Hamas or any terror organization. July 14, 2016 - After a Bastille Day fireworks display in Nice, France, a man drives a 20-ton rental truck into the crowd, striking and killing 86 people. The attacker, Mohamed Lahouaiej Bouhlel, 31, a Tunisian national, drives nearly a mile on the beachfront promenade before he is shot and killed by authorities. French officials say Bouhlel seemed to become radicalized "very quickly" by ISIS propaganda before the attack. He also suffered from mental illness, according to his father. November 28, 2016 - At Ohio State University, 11 people are injured when a student, Abdul Razak Ali Artan, 18, carries out a car and knife attack. A campus police officer shoots and kills Artan, whom police believe was inspired by ISIS and the radical cleric, Anwar al-Awlaki. December 19, 2016 - A Tunisian man drives a tractor trailer into a Christmas market in Berlin, killing 12 people. In the wake of the attack, authorities conduct a manhunt for Anis Amri, 24, throughout Europe. He is shot and killed by police in Milan, Italy, four days after the attack. Hours after Amri dies, ISIS releases a video of him pledging allegiance to the terrorist group. March 22, 2017 - A man drives an SUV into a crowd on the sidewalk along the Westminster Bridge in London, killing at least four. After ramming the car into a barrier outside the House of Parliament, the driver exits the vehicle and stabs a police officer to death. The attacker is then gunned down by a police officer. The assailant, Khalid Masood, 52, of West Midlands, reportedly had a criminal record and may have had connections to violent extremism, British Prime Minister Theresa May says. April 7, 2017 - Four people are killed when a truck drives into pedestrians on a busy street in the center of Stockholm, Sweden, before crashing into a department store. A fifth victim dies from her injuries three weeks later. The attacker, Rakhmat Akilov, a 39-year-old from Uzbekistan, admitted to carrying out a "terrorist crime," his lawyer says. Akilov is later sentenced to life in prison. June 3, 2017 - Eight people are killed in two terror attacks in central London before police shoot three suspects dead, the Metropolitan police say. The violence begins when a van swerves into throngs of pedestrians on London Bridge. The suspects then jump out of the van and proceed on foot to nearby Borough Market, a popular nightlife spot, where witnesses say they produce knives and slash indiscriminately at people in restaurants and bars. At least 48 people are taken to hospitals, according to the London Ambulance Service. June 19, 2017 - Just after midnight, a van plows into a group of pedestrians who had attended late-night prayers at London's Finsbury Park Mosque, killing one man and injuring 11 people. The driver is arrested at the scene for attempted murder and further held on suspicion of terrorism offenses. 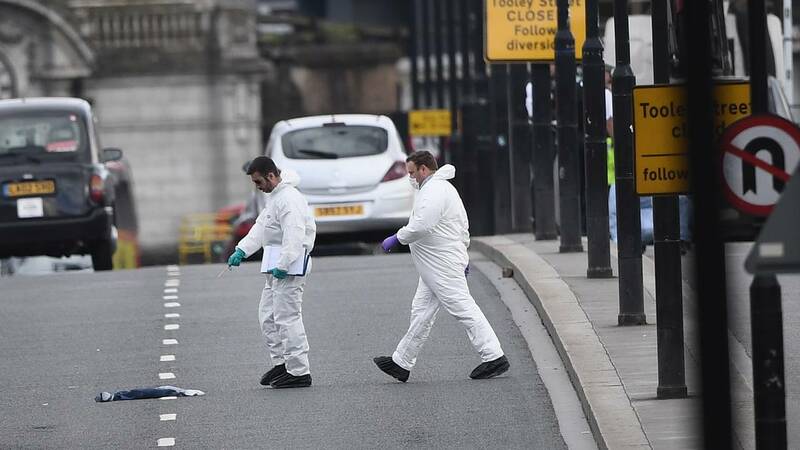 The suspect is later identified as Darren Osborne, 47, a resident of Cardiff in Wales, according to multiple UK media outlets. Osborne is later sentenced to life imprisonment with a minimum term of 43 years. August 16-18, 2017 - At least 13 people are killed and about 100 are injured on August 17 after a van plows through a crowd of people in a popular tourist district in Barcelona, Spain. Two suspects are arrested, but the driver gets away, according to police. ISIS' media wing, Amaq, issues a statement claiming responsibility, saying that the attackers are "soldiers of the Islamic State." On August 18, in Cambrils, a coastal city around 100 kilometers from Barcelona, five attackers drive an Audi A3 into several pedestrians, killing one. The attackers are shot and killed by police. A house explosion on August 16, in Alcanar, south of Barcelona, is also believed to be connected to the attacks. September 30-October 1, 2017 - On September 30 in Edmonton, Canada, a man purposely strikes a police officer with a white Chevrolet Malibu before jumping out of the vehicle, stabbing the officer several times with a knife and fleeing on foot. There is an ISIS flag in the car, which is later seized as evidence. Just before midnight that same day, a police officer stops a U-Haul truck at a checkpoint and recognizes the driver's name as similar to that of the Chevrolet's registered owner. The U-Haul truck then speeds off toward downtown Edmonton. During the chase, the truck deliberately attempts to hit pedestrians in crosswalks and alleys, injuring at least four pedestrians. Abdulahi Hasan Sharif, 30, a Somali refugee, is later charged with five counts of attempted murder, dangerous driving, criminal flight causing bodily harm and possession of a weapon for a dangerous purpose. October 31, 2017 - Eight people are killed and almost a dozen injured when a 29-year-old man in a rented pickup truck drives down a busy bicycle path near the World Trade Center in New York. The captured suspect has been identified as Sayfullo Habibullaevic Saipov. Authorities found a note near the truck used in the incident, claiming the attack was made in the name of ISIS, a senior law enforcement official said. July 29, 2018 - Four cyclists - two Americans, a Swiss man and a man from the Netherlands - are killed and three others are injured when they are run down by a car in southern Tajikistan. The car's occupants leave the vehicle and begin attacking the cyclists with knives. A day later, ISIS claims responsibility for the attack. August 14, 2018 - A car crashes into security barriers outside the UK's Houses of Parliament during the morning rush hour, injuring several people. The driver is arrested on suspicion of terrorist offenses. He is later identified as Salih Khater, a 29-year-old UK national who emigrated from Sudan.